Once you’re logged in, you start by clicking on “Templates”. And then on “Create Template”. Then you choose which template you want to use. On the picture below, I have tried to create a template for a newsletter. MailChimp requires you to delete the boxes in the template that you do not use before you can send the e-mail. Remember to press “Save and Exit” in the bottom right corner. On the next page, you click on “Campaign”. Then you will access this page where you can create a new e-mail. Here you should start by giving the e-mail a name or headding. On this page you are asked to define recipients, sender, subject, and content. 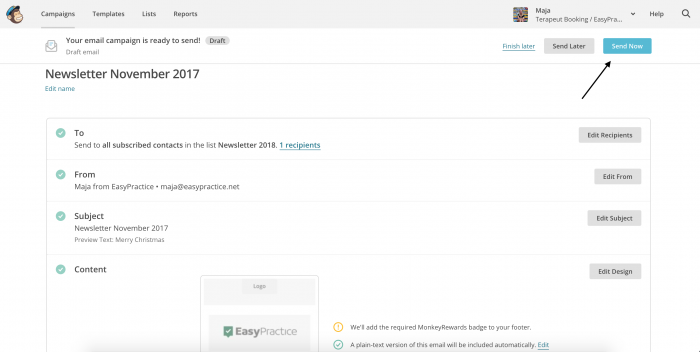 Click here to see a guide on how to import your clients to MailChimp. 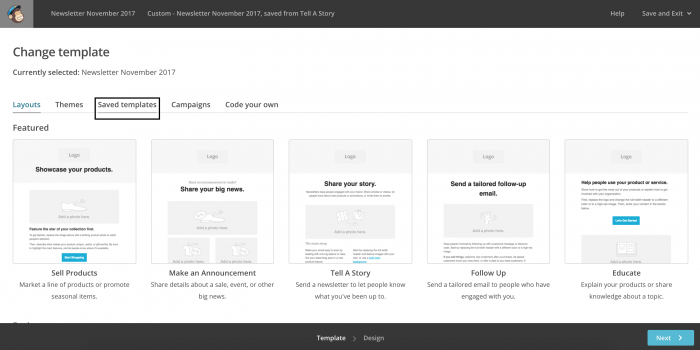 In the design e-mail box you can add the template you have just created. If you click on “Saved templates” you can add the template here. Now you should get to this page. If all steps are marked with a green ✔️ it means that your campaign is ready to be send now. Lastly, you click ”Send Now”. Now your e-mail has been sent to your clients. One last note: At the top of the screen, if you can click on “Reports” you are able to track your e-mails. I hope this guide makes sense, otherwise please send me an e-mail at maja@easypractice.net and I will do my best to help you.